The impact technology is having on our relationships, brain wiring, and kids remains a topic I’m asked to write about and speak on quite often. The consequence of this is that many people wrongly assume I’m against technology. I actually use it quite often. In fact, the Straub household consists of three flat-screen TV’s, two laptop computers, a desktop, two iPhones, an iPad, an iPod, and a drone in a pear tree. Okay, so the latter is an exaggeration—for now. Experts tell me it’s best to wait until spring to plant a pear tree. You get the point. We have it and we use it. I don’t believe technology is bad. I believe technology without limits is bad. And that’s why there’s such a demand for people of all ages, particularly parents, to learn how to set limits on technology. Families are learning firsthand what happens when they don’t set limits. And in some, perhaps many cases, it’s not that we need to turn off the screens, it’s that we need to change the content on them. With school back in full swing, and our kids using all kinds of technology, I want to briefly summarize some of the most recent scientific findings on screen time and how you can use this data to your kids’ advantage, giving them the best possible opportunity for success. 1. 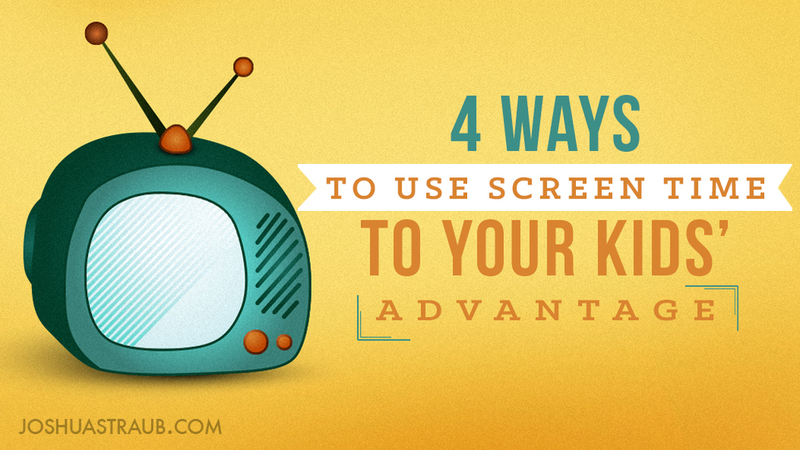 In 1970, the average age of first screen exposure was 4 years old. Today it is 4 months old. Research clearly and consistently shows that TV is not good for young kids, but at least most kids “back in the day” were already past their most critical years of brain development before even being first exposed to a screen. Giving your kids an advantage: If you’re like us and need to use screens to sometimes maintain your sanity, cut your kids’ fingernails, or get ready in the morning, use the screen wisely and sparingly. Screens used to be in houses only. Now we can take them everywhere. For ideas on content, you may want to check out a blog I wrote called Why Mister Rogers is Smarter than Baby Einstein, a post that hones in on one of the most significant reasons we need to pay attention to what our children under age 7 are exposed to. 2. Children under 5 get 4 ½ hours of screen time per day; that is 40% of their waking hours. Kids and teens 8-18 year-olds spend an average of 7 hours and 38 minutes a day on screens, not including homework. Parents, on average, spend 2-3 hours a day with their kids. Research clearly shows a negative correlation between parental involvement and screen time. The more screen time, the less parental warmth and attachment. Giving your kids an advantage: My recommendation is to keep your kids’ screen time under age 8 to less than one hour a day and age 8-18 to two hours a day. Invite your kids in the evening to help you cook dinner, do yard work, or even discuss appropriate parts of your workday with you. Having them help you problem solve some of your difficult situations not only builds their brain, but they’re also invited into your inner world. 3. Too much screen time, or the wrong kind of content can be harmful. Violent video games and TV shows lead to much higher rates of aggression in adulthood, and even criminal conviction, than kids exposed to more neutral content. The same is true for sexual content and earlier sexual involvement. Giving your kids an advantage: If you keep the TV on in your house as background noise, pay attention to what’s on it. Kids not only pick up on images, but they pick up on verbal content. If you’re not going to turn off the TV, at least change the channel. 85 percent of iPad apps for children are just “drill and practice” apps that ask kids to repeat an action and recall simple facts. These entertainment-based apps do not make your child smarter and can actually have deleterious effects on their impulse control and attention. Giving your kids an advantage: Research again clearly shows that playing with dolls, blocks, going to the park, and reading together do more for child outcomes than iPad apps. On the contrary, if you want to find helpful apps, use ones like Beck and Bo (age 3-5), Explain Everything (age 12-16), Toca Builders (age 5-12), Toontastic (age 5-9), My Story, and Art Maker, apps that require input from your child. Joshua Straub, Ph.D. is an advocate for families and parenting in the 21st century. He loves coming alongside families to provide encouragement, support and practical counsel. Josh loves combining scientific research with biblical wisdom to provide the best-of-all-worlds perspective on raising stellar kids, having an awesome marriage and enjoying life while doing it.